What oven settings do you use? What is this flour and how to substitute it? How to melt chocolate and butter? Dutch-processed vs Natural cocoa powder? What is blooming cocoa powder? Conventional A conventional oven only has 2 heating elements: one at the top and one at the bottom. I usually see conventional ovens in smaller-size ovens, like those that you put just on top of table counters. The heat generated from the heating elements are usually not distributed equally in the oven, resulting in hot and cool spots in the oven. This means that some spots on the cake will brown faster than other spots. However, this doesn’t mean it’s not a good oven, because my first oven is a conventional one and I had used it for more than 10 years before I switched to a convection oven. The key is to know where are the hot and cool spots, and rotating your baked goods halfway through baking so they bake evenly. Convection A convection oven – the one that most household owns these days – is an oven with 2 heating elements (top and bottom) and a built-in fan. The fan moves the hot air around the oven, distributing them more evenly, resulting food to be cooked faster and more evenly – it is still possible that there are some hot and cool spots in the oven. It is possible to bake two to three trays of baked goods evenly with a convection oven. Some ovens will also have a third heating element near the fan, which allows the fan to blow hot air into the oven without turning on the top and bottom heating elements. Most ovens have settings that allow you to use just the heating elements, heating elements with fan and just fan (together with the third heating element). How to adjust If recipe is using conventional oven settings, and you are using convection ovens with the heating elements and fan, lower the temperature by 10 degrees Celsius (about 15 to 20 degrees Fahrenheit) and start checking the baked goods 15 minutes before the stipulated baking time to check for doneness. If recipe is using conventional oven settings, and you are using convection ovens with just the fan as the heating element, make no changes. However, start checking the baked goods 15 minutes before the stipulated baking time to check for doneness. If recipe is using convection oven settings, and you are using conventional oven, make no changes. The baked goods may need a bit longer to be done, follow the instructions in the recipe to check for doneness. I’m currently using a convection oven, but when I’m baking desserts like cakes, I still prefer to use just the top and bottom heating elements only (just like a conventional oven). If I am using the fan-mode (without the top and bottom heating element), I will lower the temperature by 5 to 10 degrees Celsius. When I’m baking savoury food like meat, vegetables etc, I like to use the fan-mode (without the top and bottom heating element) as it circulates heat more evenly and I can bake more than a tray of food at one go. Both the heating elements and fan are used together when I’m preheating the oven for pizzas, which I will then change to pizza mode that my oven offers – a combination of top broiler element, bottom heating element and fan. All-purpose flour / plain flour The most commonly used white flour with 8 to 11% of protein (gluten). 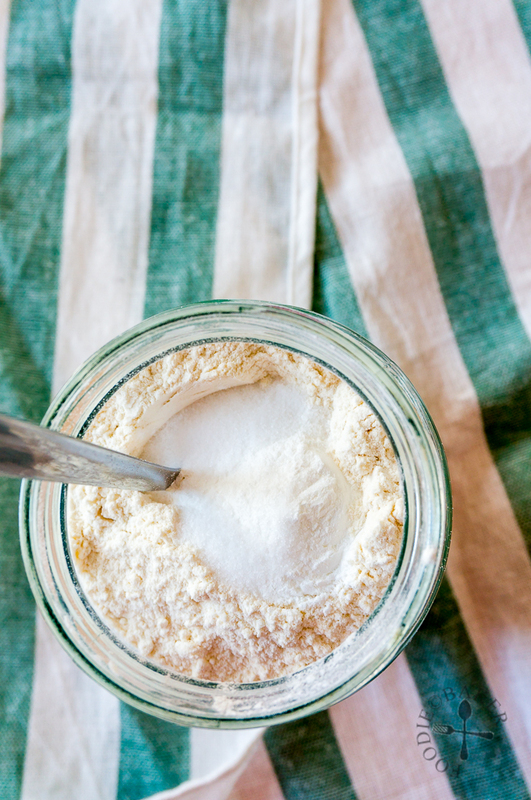 Bleached flour has less protein than unbleached. It can be used for cakes, cookies, pastries, some types of breads… There’s no substitute for it so I always stock up at least 3 kilograms worth of flour at flour at home because I finish them real fast. Bread flour Bread flour is also a type of white flour, but has more gluten strength and a higher protein content than all-purpose flour (12 to 14%). It is this gluten strength which makes bread… bread. So as the name suggests, use this for breads, buns. I don’t think there’s a substitute for it so just grab a packet when you need it. Cake flour / pastry flour Cake flour has a low protein content of 6 to 8% and it’s supposed to give cakes and cookies a tender and delicate texture. Pastry flour is apparently similar to cake flour, but I’ve never seen nor use it before. According to most websites, for each cup of cake flour, use 7/8 cup of plain flour with 1/8 cup of corn starch. However, my ratio is a little different – for each cup of cake flour, I use 3/4 cup of plain flour and 1/4 cup of corn starch. So far it has worked for me for all the recipes I’ve tried. Remember to whisk everything well together before incorporating into the batter. Self-raising flour Self-raising flour is simply flour + salt + baking powder. I never, ever stock this at home anymore because it’s such a waste of space and money because if you bake often, you will always have the necessary ingredients on hand to make this on your own. For each cup (125 grams) of self-raising flour needed, add 1 1/2 teaspoons baking powder and 1/2 teaspoon fine sea/table salt into the recipe. Scale the amounts of baking powder and salt accordingly but if the amount of self-raising flour needed is like a weird amount (say 150 grams), I simply stick to 1 1/2 teaspoons baking powder and 1/2 teaspoon salt. Remember to whisk everything well together before incorporating into the batter. Glutinous rice flour Also known as sweet rice flour, chapssalgaru (Korean) or mochiko (Japanese), glutinous rice flour is made by grinding glutinous rice. It has a higher starch content which helps create a nice and stretchy dough like those in snow skin mooncakes. Despite its name “sweet rice flour”, it is not sweet at all. Rice flour Made by grinding rice (not glutinous rice). It is usually use as a substitute for all-purpose flour as it does not contain any gluten. I haven’t really explore rice flour recipes as I’m not gluten-intolerant, however I found that they make really good melt-in-the-mouth Chinese New Year Peanut Cookies! Cornstarch Also my must-have ingredient in the pantry, cornstarch (sometimes I call it cornflour) is a powdery white flour derived from the corn grain or wheat. It is not to be confused with cornmeal! I use it most often to coat meat pieces for deep-frying and thicken gravies. Grab a small pot and a heatproof bowl – the bowl should fit snugly on top of the pot. Fill the pot with water until the bottom of the bowl is 1 to 2 inches away from the water surface. Bring the water to a boil then turn the heat down to the lowest setting. The water should be a bare simmer. Chop the chocolate into small, even pieces (about the size of chocolate chips) and place them in the heatproof bowl and set the bowl on top of the pot. Stir frequently with a spatula / metal spoon / wooden spoon until almost all the chocolate (80 to 90%) has melted. The water should never come to a boil – if the water is boiling, simply remove the pot from the heat. Return the pot to heat if needed. Remove the bowl immediately from the pot and stir constantly until the remaining chocolate has melted. Use immediately or let cool slightly before using (depends on the recipe). Chop the chocolate into small, even pieces (about the size of chocolate chips and transfer them into a heatproof and microwave-safe bowl. Microwave on full power for 30 seconds. Take out the chocolate and give it a stir. Return the chocolate to the microwave and microwave on full power for 20 seconds. Take out the chocolate and give it a stir. Repeat step 3 until almost all the chocolate (80 to 90%) has melted. Stir to melt the remaining chocolate with residual heat. The mixture melts best when the butter is at room temperature and chopped into small pieces. Combine the butter and chocolate together in the bowl and follow the steps for How to Melt Chocolate. Remove the mixture when almost all the chocolate and butter (80 to 90%) has melted and stir to use the residual heat to melt the remaining chocolate and butter. If the mixture gets too hot, the butter (including cocoa butter) will separate from the chocolate and the mixture will no longer be homogeneous. Chocolate is naturally acidic, so Natural cocoa powder, as its name suggests, is natural, untreated and acidic, and light brown in colour. Dutch-processed cocoa powder, on the other hand, is treated with a solution to neutralise their acidity and usually takes on a darker colour after being treated. When recipes state to use Natural cocoa powder, you will find that the leavening agents in that recipe contains baking soda (to neutralise the acidity) and sometimes baking powder (depending on the type of bake). For Dutch-processed cocoa powder, baking soda is not required to neutralise the acidity, so usually only baking powder is required as a leavening agent. I personally prefer and am using Dutch-processed cocoa powder because I find the chocolate flavour more intense, the baked goods have a really dark and intense colour, and I don’t have to waste space storing 2 types of cocoa powder at home. Whenever I experiment with a cake recipe that requires cocoa powder (but doesn’t state what kind of cocoa powder), I will simply omit the baking soda and add a bit of baking powder (if it’s not already included in the recipe). For cookies that uses cocoa powder, I’ll omit the baking soda. Cocoa powder is “bloomed” when it is whisked together with a hot liquid, such as water or coffee. By doing so, it intensifies the chocolate flavour by releasing the flavour particles trapped in the cocoa powder. Sometimes when I feel like blooming the cocoa powder but the recipe doesn’t state so, I will whisk the cocoa powder to boiling water in the ratio of 1:1 (by weight). The cocoa powder will thicken the liquid into a paste, which can then be incorporated into whatever I’m making. However this method won’t work for cookies or tart crust because they usually don’t have liquid ingredients.